The most important job of all solar charge controllers is to properly charge the batteries and to give them as long a life as possible. The solar charge controller is the central component in a stand-alone system. It controls the energy flow in the entire system and determines the system function and service life. This means that a suitable solar charge controller must be selected carefully. 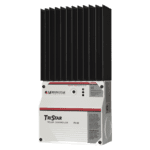 The solar charge controller only accounts for between 3 % and 5 % of the total cost of a stand-alone system, and yet it is the most important component. A high-quality, reliable solar charge controller in a higher price class pays for itself very quickly, as it increases the battery life and thus leads to a significant saving in system costs. Solar charge controllers in general are available as professional hybrid-shunt controllers, serial charge controllers or MPP trackers. A suitable topology should be selected depending on the requirements of the application. Switch charge controllers such as shunt and serial charge controllers can only be used on 12 V systems in connection with 36-cell solar modules. On 24 V or 48 V systems, two 36-cell solar modules (24 V) or two 72-cell solar modules (48 V) must be wired serially as a string. Serial charge controllers are well suited to small applications and solar home systems. Shunt controllers are recommended for larger-scale applications and hybrid systems, as these have a lower power loss during charging. Due to their good electromagnetic compatibility, shunt controllers are also recommended for use in telecommunication applications. A solar charge controller with MPP tracking must be used when solar modules which are not comprised of 36 or 72 cells are used. These include most optimised solar modules for grid-connected systems and all thin-film modules. The use of an MPP tracker is also increasingly recommended depending on the coldness of the average annual temperature and importance of efficient charging at low battery charges (even when standard 36-cell modules are used). The short-circuit current (Isc) of the solar module is decisive when dimensioning solar charge controllers (under standard test conditions). The manufacturers recommends always dimensioning the solar charge controller generously. The rated current on the solar charge controller should be approximately 20 % higher than the total short-circuit current on all connected solar modules. In order to ensure a long service life, it is important to use a robust solar charge controller with short, thick cables for connecting it to the battery. The device should always be screwed to a non-flammable wall directly above the battery. It is important that there is enough free space around the solar charge controller so that it can be cooled sufficiently by the ambient air. The guidelines in the instruction manuals must be adhered to in all cases. It makes sense to use solar charge controllers with additional functions in applications with stand-alone inverters or hybrid systems. The possibility of connecting to the stand-alone inverters for communication and synchronisation of the devices is a requirement for effective inverter systems or hybrid systems. Special energy management functions remain of key importance on hybrid systems.